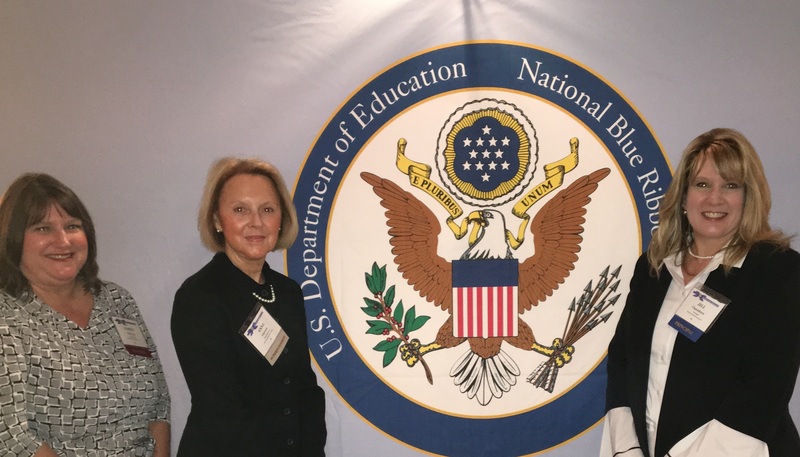 Last week, Riverbend’s principal, Mrs. Jill Chambers, and lead teacher, Mrs. Karen Keeling, along with superintendent, Dr. Anne Garrett, attended the National Blue Ribbon Schools Recognition Ceremony in Washington D.C. They were presented a National Blue Ribbon School flag and plaque by Aba Kumi, Director of NBRS, at a special luncheon on Tuesday, November 7. For 35 years, the Department of Education has recognized outstanding American schools. Riverbend received the 2017 National Blue Ribbon honor for Exemplary High Performance for being in the Nation’s top 15% in English and mathematics, measured by state assessments. In North Carolina, only 147 schools have earned this award, and only 5 schools have won it twice. Riverbend Elementary is one of those 5 schools in North Carolina to have earned the National Blue Ribbon Award for Exemplary High Performance twice, in 2011 and 2017.